In 1894, about the same time that the Gold Mountain operations at Big Bear Lake were struggling along, another interesting big money venture for extracting gold from the Big Bear area was being carried out by the “Valley Gold Company Ltd.”. This London based company organized both English and American investors to finance a major effort to recover placer gold from Holcomb creek just north of Big Bear Lake. In order to turn a profit it would be necessary to find a way to move large amounts of dirt. The hydraulic mining techniques normally used in northern California were all but impossible because that process required massive amounts of water that just wasn’t available in Holcomb Valley. So, they came up with the idea of hauling a massive railroad steam shovel up into Holcomb Valley. Just getting this railroad steam shovel up the steep mountains into the valley was a major operation. Once they got it into Holcomb Valley the shovel was then mounted on short sections of railroad track. To move the shovel across the valley, the railroad tracks would be pulled up from behind the shovel and then re laid down in front of it. Then the shovel would be pushed forward on to the newly laid tracks. 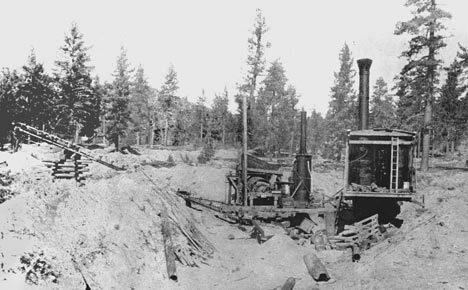 The Valley Gold Company Ltd. steam shovel at work in Holcomb Valley. The separator, called the grizzly, can be seen on the right. – Rick Keppler Collection. This steam shovel could move about a cubic yard of dirt with each scoop. The dirt would then be dropped into a hopper on a device known as a grizzly which would separate the dirt from the rocks. The remaining fine dirt would eventually be run through a sluice box to separate the gold from the dirt. Using this method back in 1895, the steam shovel dug a trench 8 feet deep, 16 feet wide, and 3,000 feet long across the Holcomb Valley floor looking for gold. This expensive operation did manage to find some gold, but not in the huge quantities that was hoped for. 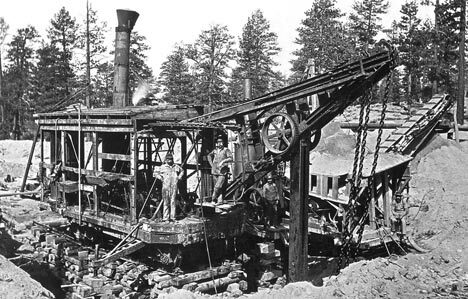 Here is a rear view of the Valley Gold Company Ltd. steam shovel and grizzly working their way across Holcomb Valley in the late 1800’s. – Rick Keppler Collection. The only real money made by the “Valley Gold Limited Ltd.” were the riches they got from mining their investors of their life savings. This Holcomb Valley financial failure drew international notoriety when it became known as the “London Scam”. If your beginning to think that the Big Bear Gold Rush was mostly hype, your right. 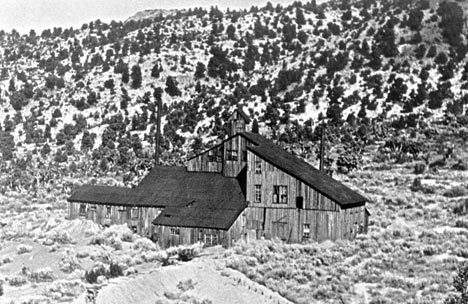 However, just east of Big Bear Valley is a place called Lone Valley, and it is was here that we find the most profitable mining operation in the San Bernardino Mountains. It was originally filed as the “Homestake Mine” in 1887. Later in 1889, James Smart, A.G. Watts, and M.F. Sweat took it over and renamed it the Rose Mine. This group operated it for two years then sold their interest to the Morongo Mining & Milling Company. The new company installed a 40 stamp mill and a 50 ton cyanide plant. Most stamp mills are usually built on the side of a mountain next to a horizontal mine shaft tunnel. Miners would then take the mined ore and drop it into the side of the stamp mill. Gravity would then pull the ore down chutes into the waiting stamps to be crushed. The Rose Mine mill was different. It was built in the middle of a flat valley on top of a mine shaft that went straight down. Because of this, the Rose Mine stamp mill had a tower that can be seen above the roof line. The tower housed a pulley system that was needed to haul the ore up out of the ground. The Rose Mine stamp mill. Since the mine shaft ran vertically down into the ground, a pulley system was needed to haul the ore up out of the ground. This system was housed in the small tower located on the roof. – Rick Keppler Collection. The Rose Mine vertical shafts went as deep as 450 feet. At various levels, horizontal shafts reached out as far as 2,000 feet. But it was worth the extra expense. While the Gold Mountain Mine was getting all the publicity, the Rose Mine was quietly producing high grade ore that consistently assayed out at $200 to $500 per ton. Up until 1906, it was estimated that between $600,000 to $1,250,000 in gold was pulled out of it’s maze of underground tunnels. The Rose Mine has been shut down for almost 100 years. Recently however, this mine was purchased by a group of investors. It is now under consideration to either preserve it as a historical site, or to reopen it as a working mine. As soon as we get the final word we will let you know.